Supernatural 8x21 "The Great Escapist"
Ummm can we all agree that maybe that was one of the best episodes of the season so far? Maybe the best? Right? I started thinking that halfway through the episode, then remembered it was written by Ben Edlund, and was like oh well derrr de derr, obviously. I'm not sure I have disliked any of his episodes. Not to say that the episode isn't planned out before the specific writer gets his hands on it, but would any of the other writers come up with that story about the farty donkey? Come on. Before I wax too effusive about his dialogue, because surely it is some of my favorite, I'll restrain myself and rather get down to the biznatch. Look out Winchesters, I've got a gun on you! Unheard of! Uncanny! So! Lest we forget, Kevin was taken away by Crowley a few episodes back. At the time we were maybe supposed to question whether he just lost it and ran away, but all of that questioning was dispelled post haste when we found him holed up, working on the tablet, with a fake Sam and Dean bringing him the half that Crowley took earlier on. It was fairly obvious that they weren't the real Sam and Dean, and Crowley must've thought Kevin was easily duped too. But, no. Kevin Tran ain't no dummy. Meanwhile, however, the boys are back in the bunker, with not much of a clue what to do, and Sam appears to be getting worse rather than better. He thinks he'll start feeling better once they get back to working on said trials, and pretty much as soon as he says that, they get a video message from Kevin saying he must be dead and here's some info on the last trial. Dean is sure pissed about another innocent dying, but don't worry Dean, he's not really dead. Calm yourself. After Sam looks through the stuff, he notices this same symbol has been appearing throughout the notes, and he happens to remember that same symbol from a class he took back at Stanford. Now, this seems super convenient until we realize the trials are making him remember all sorts of minute details about his life. Anyway, basically, he thinks that the messenger of GAHHG, Metatron himself, is holed up on a mountain with some Native Americans. Or Indians, if you're Dean. Yeah, like you're the first one to do that. Puh-lease! While all of that is going on, we also catch up with Castiel, who's been in the wind ever since he got the angel tablet. He's been flitting from Biggerson's (or is it Big Gerson's?) around the country to mask his trail, and so far has been rather successful. But, they manage to catch him by killing a bunch of the people at one of his previous stops. Naomi is mad, duh, and wants to know where the angel tablet is. Cas isn't saying, and before she can do anything more than punch him around a bit, Crowley shows up with a special angel-killing gun, scaring her off. It turns out, Castiel didn't bury the tablet per se. Since touching the tablet dissolved his psychic link to the home office, why would he stop touching it? Exactly. He stuck it inside his body, which Crowley takes out. Ruh-roh. In the mountains, Sam and Dean track down the elusive Metatron, who has been hiding out for centuries, not wanting to get involved in any of the demon and angel shenanigans after GAHHG flew the coop. But, when the Winchesters confront him with all of the death and despair, he decides to lend his help. Crowley takes the angel tablet back to Kevin, who reveals that he's known for a while that the Sam and Dean visiting him weren't real, mostly because they were too nice. Ha! Crowley gets ready to smack him around, but suddenly he goes all white angel-ly and disappears. Metatron got him out of there because he's like, a super special angel who can re-write angel warding stuff or something. Anyway, Kevin doesn't even get to do the big reveal of the final trial thanks to Metatron stealing his thunder by blurting that it's to clean a demon, or basically turn a demon back human or something. Kevin's all who the hell is this, taking my moment?! 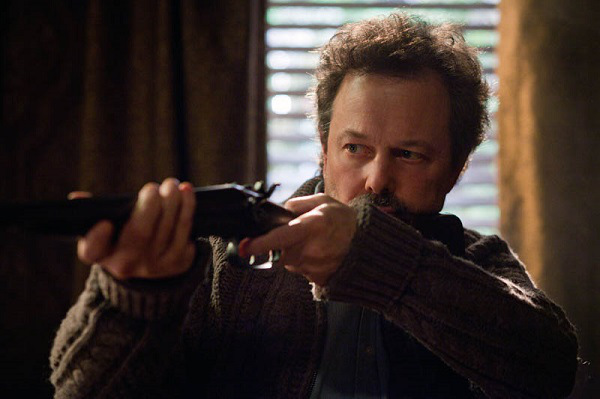 Metatron could've gone all "I'm you're prophetic father, SON!" but refrained. So, the brothers now have the final trial in their sights - cleanse a demon or whatever it was called. Alas, I did not write it down and am clearly too lazy to turn to the TV back on and rewind the thing. Sam already feels better now that he has a purpose. They're discussing this while driving when they happen upon a figure lying in the road... none other than Castiel. Reunited! - You guys! I had seen theories around about the trials purifying the demon blood out of Sam and thought how that would be awesome but probably unlikely given how awesome, and look! Look! It's happening! What! - Is it a coincidence that the messenger angel's name is METAtron when he started talking about how the greatest power of humans is their ability to tell stories and come up with all sorts of worlds, become mini GAHHGs themselves? While on a TV show created by humans! It's so meta! - I love delirious Sam, he's so unintentionally hilarious. - Kevin brought back the other half of the demon tablet with him, but did he leave the angel tablet with Crowley? I mean, I guess Crowley can't decipher it without him, but still. - Can we have more random childhood stories, please? I think we all love them, yeah? Farty donkey ones, especially. Crowley: I was born to direct. 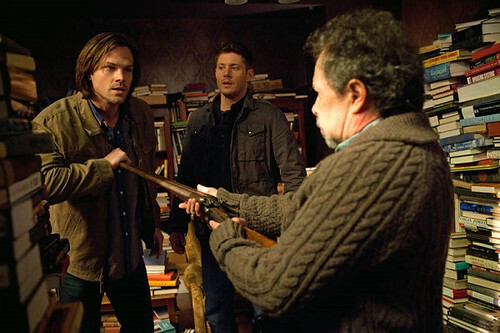 Dean: You really think this Metatron is hanging out in the mountains with a bunch of Indians? Dean: ... You are delirious. Sam: Ohhh you rode a farty donkey! Crowley: I am the daringest devil you've ever met, love. Sam: You really haven't heard of us? What kind of angel are you? We're the freakin' Winchesters. One of my favorite moments was Sam and Dean's disbelief that Metatron didn't know who they are. In nearly every episode, some character says sardonically, "The Winchesters." Right? Delirious Sam was all offended, and Dean just kind of shrugged like yeah, we're kinda famous, no big thang.